Many of these customized stamps can be your personalized stamp with your names, date or your photograph. Available in three sizes and all denominations. Click any wedding stamp for a closer look. 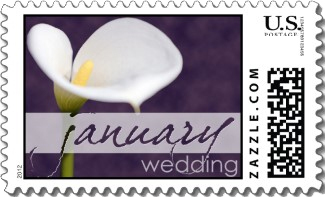 A classy Calla Lily is the highlight of this purple January wedding stamp with a lovely script font for "January". Soft winter white rose against a chocolate background. Swirly font for "January" and a block font for "WEDDING". A lovely January wedding stamp. 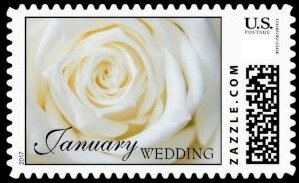 Stunning white and red roses against a black background make for a classical January wedding stamp. 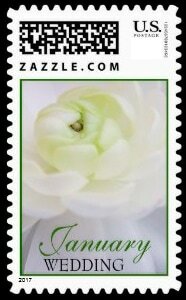 A snowy white Ranunculus with a soft green interior make this a compelling January wedding stamp. January in green script font and the text "WEDDING" below. 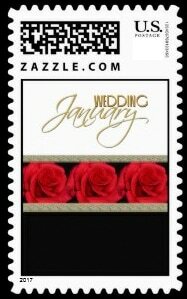 Elegant January wedding stamp with the text "January Wedding" against a white background. A band of red roses separates a black fill at the bottom. 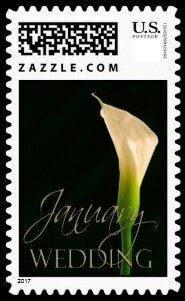 Dramatic white calla lily against a dark background with January Wedding in attractive fonts. Stylish January wedding stamp. Soft blue January wedding stamp with text in a blue band along the top and blue snowflakes against a white background. 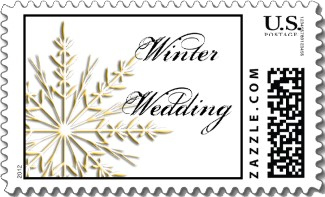 An oversized golden snowflake against a white background makes a stylish winter wedding stamp. The black text "Winter Wedding" can be changed to whatever text or month you want. Beautiful white and purple bouquet makes for a colorful January wedding stamp. Swirly text in a light screen near the bottom. Really quite stunning. Soft pink rose interior with the text "January Wedding" in white at the bottom. A lovely rose wedding stamp. 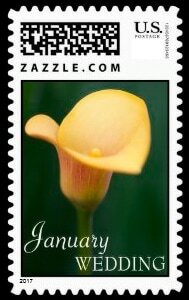 This beautiful January wedding postage stamp features a yellow calla lily with a green background and the text "January Wedding" near the bottom. 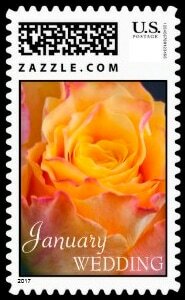 A lovely orange blushing rose wedding stamp fills the frame with the text "January Wedding" near the bottom. 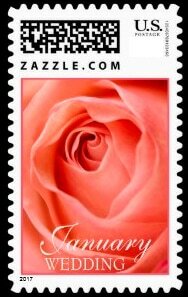 A close in photograph of a white rose fills the frame January wedding stamp. The black text "January Wedding" near the base. 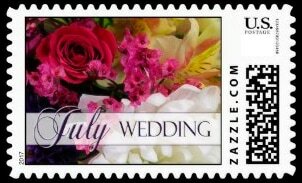 A beautiful floral wedding stamp stamp designed for any month! Use the CUSTOMIZE button to change for your wedding month. Shaded blue to a light pink with a snowy background, this January wedding stamp has the blue text over a light screen through the center. 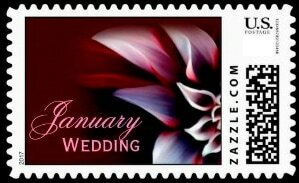 Subtle reds turn to pink with swirling hearts in the background of this pastel February wedding postage stamp. A vintage red Love wedding stamp is perfect for the month holding Valentine's Day. A beautiful chocolate mint wedding stamp in damask fabric. Script text for "February" in the mint green banner at the bottom. 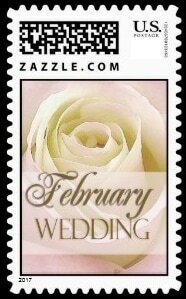 A lovely February wedding stamp with soft white rose background. The text "February Wedding" in a gold font over a screened banner. A wonderful February wedding stamp. Cream flowers with blue accent and pin stripe bar and February Wedding in script font. Quite compelling. A very pretty February wedding stamp with soft yellow calla lily against a green background and the text "February Wedding" at the bottom. Compelling image of two chocolate hearts labeled as "I Do" against a formal white table cloth will the frame of this February wedding stamp. Swirly text in the upper left "February Wedding". 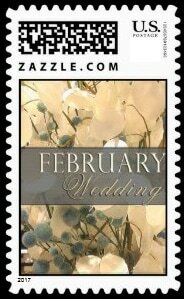 Soft and creamy, this February wedding stamp has an arrangement of calla lilies with the text "February Wedding" near the bottom. Delightful to look at. Two floating gold wedding rings against a backdrop of gold sparks makes this February wedding stamp quite stylish. Formal swirl font for the text "February Wedding". 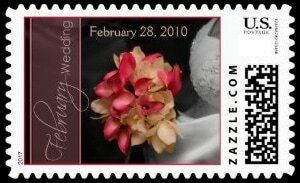 An exceptional custom Feburary wedding stamp with a hint of a bride holding a bouquet of calla lilies. The text "February Wedding" on the left and your date at the top. 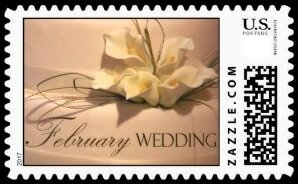 An exceptional February wedding stamp with a close up view of a white orchid with hints of green. The text "February" in a swirly font picks up the soft green of the flower. Soft swirly red pattern of hearts fill the frame of this February wedding stamp's background. An elegant set of fonts for the text "February Wedding" in the foreground. Wonderfully purple February wedding stamp has background filled with the text "February" in many different fonts. A screened banner in the center for the text "February Wedding. Close up of a soft cream rose is the background for this March wedding stamp with "March" written in a wonderfully swirly font. Beautiful floral artwork with lovely cherry blossoms in green and white tones making it modern, stylish and perfect wedding postage stamp for your March wedding. An elegant personalized Irish wedding stamp with clovers and swirls. Change the date and even the "Save the Date" text to make this March wedding stamp your own. A blushing yellow rose fills the frame of this March wedding stamp. The text "March Wedding" near the bottom. 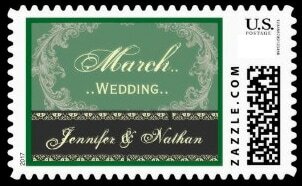 It is hard to take your eyes off this elegant March wedding stamp. The soft pink interior of a rose fills the frame with a large swirly font for the text "March Wedding" at the bottom. Eye candy. 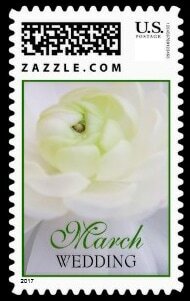 Inside a snow white rose bud with a hint of soft green and the text "March Wedding" near the bottom.An attractive March wedding stamp. 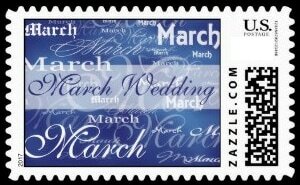 A fun and attractive blue March wedding stamp with the text "Match" in many styles filling the blue background. A white banner in the center with the text "March Wedding". Sage green background with the centered text "March Wedding". Your names in a black banner near the bottom. A chic vintage look to this March wedding stamp. 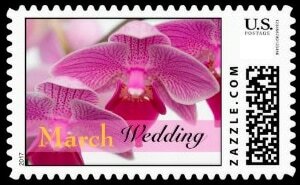 This March wedding stamp includes delightful purple orchids in the background and the text "March Wedding" in a soft transparent banner near the bottom. 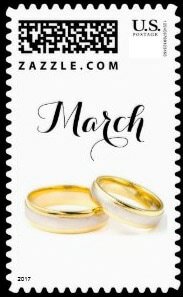 Two gold and silver wedding rings on a white background with the text "March" above in a script font. 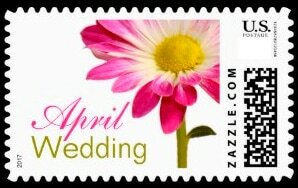 A simple and stylish March wedding postage stamp. A grand calla lily March wedding stamp with a single white calla lily against black. The text "March Wedding" near the bottom in designer fonts. 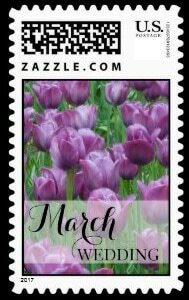 A field of purple Spring tulips fills the frame of this March wedding stamp. Wonderful and fresh. An elegant interior photograph of a white rose forms the backdrop on this March wedding stamp. Script "March" and a block font for "WEDDING" are in gold in the foreground. Stylish and attractive. 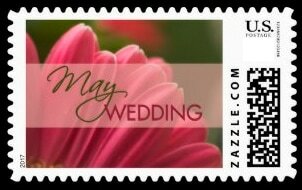 A pink Gerbera daisy nearly fills the frame of this March wedding stamp. Plant green background and a screened band through the center "March Wedding". An elegant and romantic personalized wedding stamp with beautiful script over peach tulips. Make it your's by adding your names and date. A delicate pink flowers and the text "April Wedding" in designer fonts. A lovely modern look to this April wedding stamp. Soft blue rose fills the frame of this April wedding stamp. Screen banner near the bottom for the text "April Wedding". The interior of a white blue tinted lily against a black background. The text "April Wedding" at the bottom left. A stunning April wedding stamp. 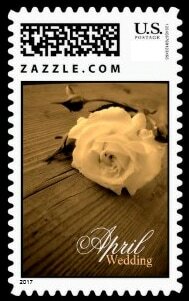 Gorgeous white rose on wood in sepia tones is the focus of this sepia April wedding stamp. The text "April Wedding" tastefully at the bottom right. Cream flowers with subdued blue accent. A gray screened banner for the text "April Wedding" in script font. Lovely April wedding stamp. Light and fresh pink, yellow and white Spring daisy to the left on white with the text "April Wedding" in designer fonts. One of the best April wedding Stamps. A single white calla lily against a purple background. A screened white band contains the text "April" in a script font with WEDDING below. A stylish April wedding stamp. Blue hydrangea flower with the script text "April Wedding". A modern April wedding stamp to be talked about. White bridal rose in vertical format with hint of red and April Wedding in gold script. These stamps will look stunning on your wedding envelopes. Very Spring like with a yellow and crisp white apple blossom. 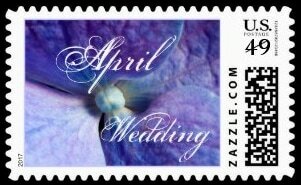 An attractive April wedding stamp. April wedding postage with violet lilacs and script writing in the soft purple background. Strong purple banner in the front holds the text "April Wedding". Striking. Pink Spring cherry blossoms in a soft white and purple background with the text "April Wedding" in a swirly script font in the bottom right corner. Text is easy to customize to make this April wedding stamp work for any month or theme. Delicate white orchid with violet highlights A gray vertical banner for the scripted text "April Wedding" in silver. Stylish April wedding stamp. Beautiful pink Gerbera daisy with a fanciful swirl font for "May" against a light transparent screen. This May wedding postage stamp features beautiful floral artwork with lovely cherry blossoms in pink and chocolate tones making it modern, stylish and perfect for your celebration. Emerald is the May birthstone and the background of this May wedding stamp. Filled with "Mays" in the background, a transparent white banner contains the main text "May Wedding" in script. 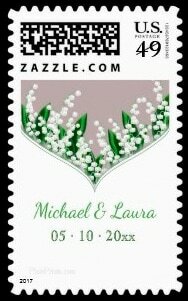 A beautiful May wedding stamp with white lily of the valley flowers. It's elegant and symbolic of sweetness and happiness. Include your names and date. An exquisite May wedding stamp with a long string of white pearls against a black background and the text "May Wedding" in white within the arc of pearls. Classic style. 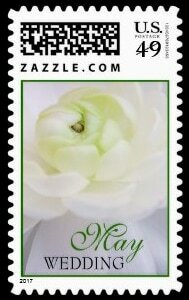 Soft white rose with green highlights are the backdrop for the text "May Wedding". Quite lovely. The sugary white rose in the background of this May wedding stamp beautifully offsets the BLACK scripted text "May" and the block text for "WEDDING". Very elegant. Elegant calla lilies against a white wedding cake with satin ribbon. Perfect postage for your May Wedding. 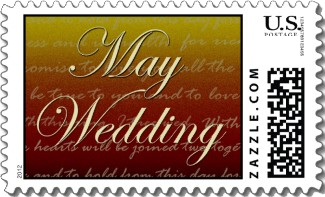 Yellow to red background filled with loving words in mouse type and "May Wedding" in a large swirly font. A simple but formal wedding invitation stamp. A beautiful single white calla lily against black with the text "May Wedding" i silver gray. A dramatic May wedding stamp. 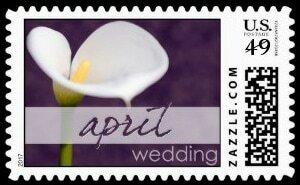 Striking white lily design features white "May Wedding" text against black for a compelling wedding stamp. A single yellow calla lily against a green grass colored background with the text "May Wedding" just below the flower. Simple and lovely. A fun wedding stamp with a beach theme. Two interlocking hearts in the sand with text "May Wedding" in ocean foam white. Exceptional white tulips with a hint of pink are set off by their greenery. The text "May Wedding" in the lower right on this wedding stamp. 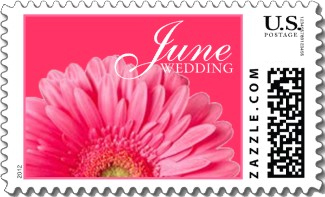 May Wedding stamp with a beautiful pink gerbera daisy! Screened banner through the center with the text "May Wedding".Perfect for your Spring wedding invitations! Delicate white orchids. The purple accent bar picks up the subtle purples within each orchid. Perfectly color coordinated wedding stamp. Soft pastel yellow and purple colored flowers with the swirly text "June Wedding" at the bottom right. Very pretty wedding stamp. Striking single pink rose on white with the swirly text "Our June Wedding" on the right. A simple and stylish wedding stamp. 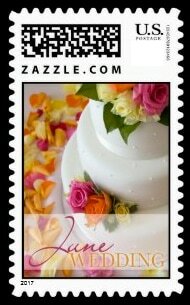 Pink, yellow and orange roses adorn a white wedding cake in this June wedding stamp. A screened banner near the bottom holds the text "June Wedding". Stylish. 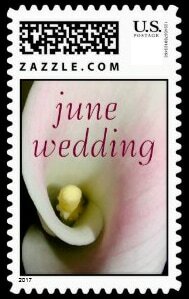 Beautiful white and pale pink Calla Lily fills the background of this June Wedding Postage Stamp. Cream flowers with blue accent and pin stripe bar with June Wedding in script font. Perfect postage for your June wedding invitations. Inside a crisp sugar white rose with the swirly text "June Wedding" in a soft gray at the bottom right. Very stylish June wedding stamp. Perfectly pink June wedding stamp with a pink Gerbera daisy against a dark pink background and the text "June Wedding in the upper right. Stunning. 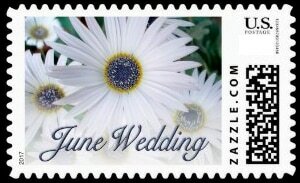 Sharp fresh white daisies with blue centers are the background for this June wedding stamp. the text June Wedding near the bottom in a blue script font. Lovely. Dramatic white calla lily against a dark background with June Wedding in designer script font. 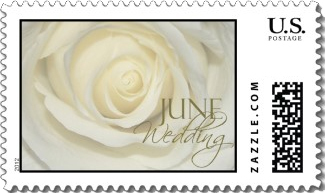 Stylish June wedding stamp. White tulip backdrop with soft blue text and banner holding the text "Save the Date". 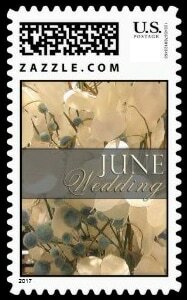 "June Wedding" in upper right and your personal date also on this June wedding stamp. White rosebud with hint of red and June Wedding in gold script font. Perfect postage to make your wedding envelopes pop. 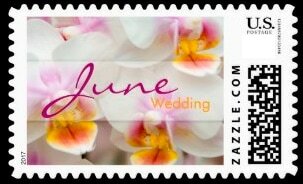 Soft white orchids with colorful centers fill the background of this June wedding stamp. The text "June Wedding" in a soft band through the center. 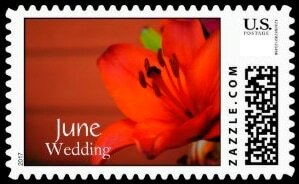 Beautifully simple fiery orange lily with June Wedding written in white font. 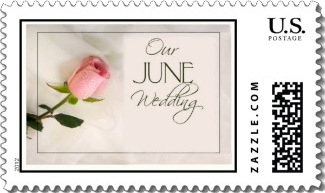 Stylish June wedding stamp with a hint of a bride holding a bouquet of calla lilies. the text "June Wedding" vertically on the left and your date at the center top. Wonderful colors. Dark reddish brown background with vibrant bouquet of orange and red calla lilies with July wedding script. Rendering of two overlapping red hearts against a mottled orange background and the text "July Wedding" above. Very nice. The many colors of pink in this Dahlia daisy make a lovely July wedding stamp. The text "July Wedding" in a pink banner at the bottom. Beautiful white and pale pink calla lily wedding stamp. The text "July wedding" in black over the top part of the flower. Vintage illustration Fourth of July holiday art deco image A young newlywed couple share a romantic kiss while fireworks explode in the night sky. Classy July wedding stamp. An ivory colored rose fills this wedding stamp's frame with a large transparent banner in the bottom half for the soft font "July Wedding". A simple and appealing design of a soft pink and yellow plumeria with "July Wedding" in a soft yellow band through the center. 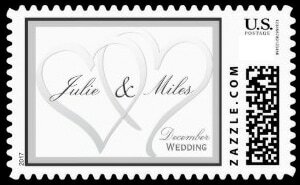 Custom month wedding stamp with two swirly silver hearts enclosing your names and the month of your wedding. 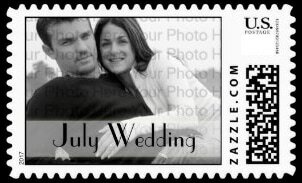 Easily add your photo to this personalized July wedding stamp. The text "July Wedding" in a screened banner below. Fireworks in July is a time honored tradition. Why not for your July wedding? Easily personalize this fireworks wedding stamp for your many different wedding mailings. 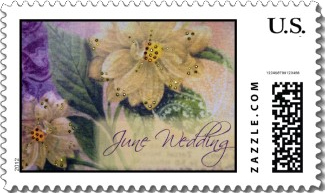 The inside of a white orange and yellow orchid fills the frame of this July wedding postage stamp. Beautiful daisies with large pink centers and the text "July Wedding" near the top. Stylish July wedding stamp. 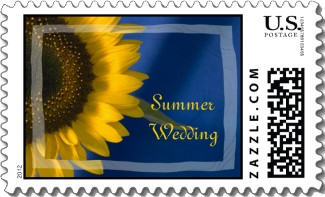 Visually strong sunflower on blue Summer wedding stamp. The text in the lower right is easily changed to what ever you want. Colorful flower bouquet of red rose, pink and yellow accent and white hydrangea with "July Wedding" in deep purple script. Vivid July Wedding Stamp. Chic and simple July wedding stamp. Or for any time of year. 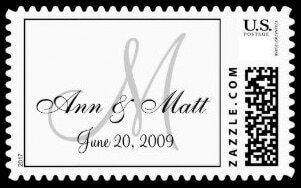 Completely customize this all text stamp with your names, initial and date. Colorful sundown in the tropics with the text "August Wedding" filling the orange sky. Captivating beach theme wedding stamp. Bright yellow and purple flowers fill the upper part of this August wedding stamp with the text "August Wedding" at the Bottom of the frame. Very appealing. An August wedding stamp with a beautiful white Ranunculus flower with hints of green. Stylized "August Wedding" at the bottom. Quite pretty. Lovely iris with shades of deep purple and soft lavender and August wedding in script against a soft purple background. Perfect postage for your August wedding correspondence. Orange and yellow Gerbera daisy off to the right makes room for the colored text "August Wedding". Easily personalize any of the text. The soft pinks and oranges of this gladiola make a wonderful August wedding stamp. Transparent peach banner for the text "August Wedding" near the bottom. Lovely colors. 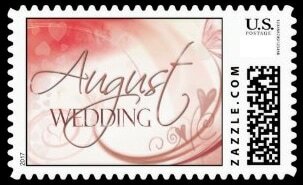 This swirling hearts August wedding postage stamp is a delight. With the text "August" in swirly font and "WEDDING" in a block font. Chic. Pink rose bouquet with baby's breath and August Wedding in script on the left going upward. Stylish. Ivory calla lilies against a soft brown background make an elegant August wedding stamp. The text "August Wedding" on the lower left in white. Dramatic fall colors floral design in orange and red. Black background with the word "Love" in a fiery script font at the bottom right. 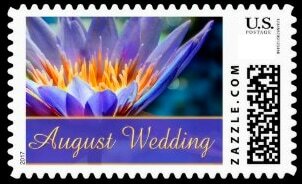 This August wedding postage stamp has a delicate white water lily with a swirly font for the white text "August". "Wedding" in a blocked and gold 3D font. Fabulous fall colors with an orange oak leaf overlaid with a yellow and green banner for the text "August". "Wedding below is a script font. Wonderful Fall wedding postage. Captivating close up inside an orange iris with soft blue solid and transparent banners for the text "August Wedding". Marvelous. Calla lilies against a white wedding cake with satin ribbon and beaded decor with "September Wedding" in script. Yellow and orange bouquet of calla lilies to the left of swirly text for "September Wedding" against a dark red background. Perfectly done wedding stamp. 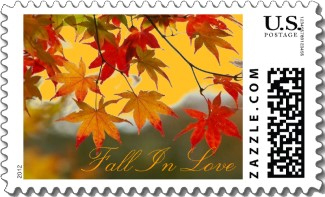 Yellow, orange and red maples leaves on a tree form the backdrop for this Fall wedding postage stamp. Text at the bottom "Fall in Love" is easy to customize. A sepia toned image of a white rose lying on wood is a stylish wedding stamp. "September Wedding" at the bottom. Elegant. The fall colors of this orange and yellow wildflower make for a wonderful September wedding postage stamp. Fall orange and yellow colored rose fills the background with the text "September Wedding" near the bottom of this September wedding stamp. Personalize for your date. 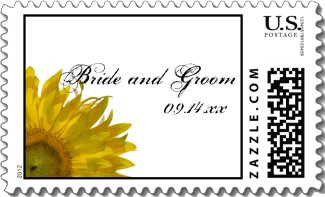 This wedding stamp has a yellow and orange sunflower peeking out from the lower left corner and your name in black center right against white. Gold, green and cream floral design form the background for this September wedding stamp. Color coordinated banner holds the text "September Wedding" in script. Gorgeous September wedding postage with a bouquet of roses in fiery Autumn colors. "September Wedding" in a fall colors font near the bottom. 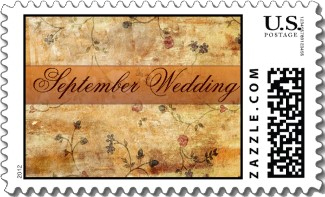 This September wedding stamp looks out over a bay at the changing fall colors. "September" overlays the water and "Wedding" has a black banner. 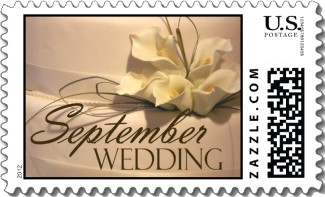 Orange and white daffodil flower makes a lovely September wedding stamp. Two gold wedding bands on a white background with "September Wedding" above and below the sparkling rings. Use this wedding stamp for any month. Easy to change the text. Exceptional photograph of orange and yellow Fall maple leaves for the background and the text "September Wedding" in matching colors at the bottom right. Just wonderful. The golden text "September Wedding" overlays a creamy white rose. 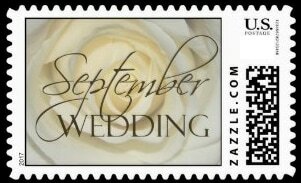 A stylish September wedding stamp. 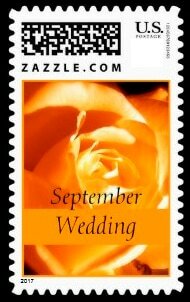 This orange tiger lily fills the frame of this September wedding postage stamp. The text "September wedding" in ivory centered at the bottom. Exquisite. Looking through red, orange and yellow Fall colored leaves at a lake with "October Wedding" at the bottom of the frame. 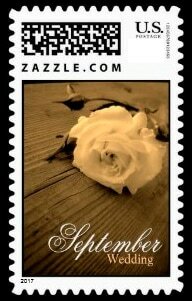 Lovely October wedding stamp. Warm colors of tan, peach and cream make this October wedding postage special. Spray of soft peach roses with baby's breath and light tan accent and "October Wedding" in script font. Two pumpkin orange overlapping hearts with mouse type words of love and "October Wedding" in swirly text at the center top. The frame of this October wedding stamp is filled with the interior of a soft orange flower. The text "October Wedding" in a chocolate brown on top. This gold and cream vintage rose bouquet with its lace accent and ornate ~ Love ~ lettering makes an elegant wedding stamp choice. 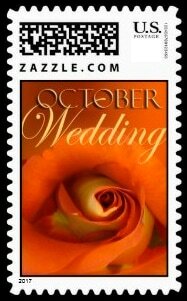 Gold, rust and an orange opening rose fill the background of this October wedding postage stamp. "October Wedding" at the top in designer fonts. Looking down the river at Fall colors reflecting in the water. The text "October Wedding" set aside in its own frame. Quite a beautiful October wedding stamp. The lower half of this October wedding postage stamp has a montage of wedding images. The upper banner holds the scripted text "October Wedding". Wonderful illustration of a forest in Fall colors against a soft brown background. Personalize with your names and date when you click the Customize button on the stamp's page. 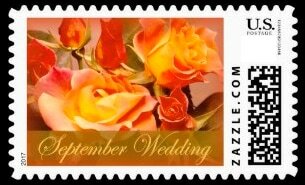 For any Fall wedding, this wedding postage stamp has a close up view of a fall wedding bouquet of subdued reds, oranges and peach. So appropriate for the season. 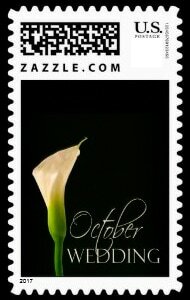 Exquisite white calla lily in full bloom is the highlight of this October wedding stamp. The text "October Wedding" at the bottom right in designer fonts. Stylish black background. 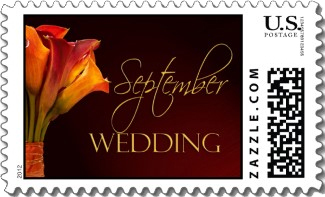 Beautifully backlit fiery red fall maples leaves against a black background make for a striking October wedding stamp. "October Wedding" at the bottom. Halloween wedding postage stamp with bats flying in front of a full moon and the text "Halloween Wedding" in a soft orange. Chocolate and turquoise October wedding stamp with stylized chrysanthemum and floral design. 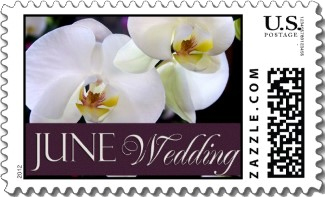 Sugar white orchids with hints of lavender and yellow are featured on this October wedding stamp. The white text "October Wedding" is held by a dark purple banner. Upload your photo to the background of this beautiful November wedding stamp "November Wedding" in the foreground against a screened banner. The bright red Fall leaves on this tree make a striking November wedding stamp. The white text on the bottom black banner is easily customized. Simple, elegant and colorful. This "Soon To Be Mr. and Mrs." wedding stamp can have the date at the bottom easily changed to your date. Click the Customize button on the stamps's page and enter your date. Sugary white rose bud fill this November wedding stamp's frame. The text "November Wedding" in designer fonts. Very chic. Simple and timeless. Two gold wedding bands on a white background with the text "November Wedding". A classy November wedding stamp. Stylish yellow and orange calla lily November Wedding stamp against a dark green background with "November Wedding" at the bottom in white type. This November wedding stamp has a dark orange background with the Fall harvest in the foreground. The text "November Wedding" at the top in a soft orange. Background of colorful Fall leaves in orange and red. November Wedding in the lower half in designer fonts against a screened banner. A fun November wedding postage stamp. A soft white calla lily against a purple background makes a compelling November Wedding stamp. The text "November" in a swirly script font against a screened white banner. "Wedding" below in a block font. This pretty Fall leaves wedding postage stamp features a digitally enhanced photograph of brown Autumn Korean Maple leaves against a cream white background. Beautifully simple. Wonderful Fall colors November wedding stamp. Orange flowers below a dark red banner with the text "November Wedding". This fall yellow rose wedding stamp will makes an elegant addition to your November wedding invitations and correspondence. Red and orange flowers form the backdrop for your monogram over a reverse colors banner. Easily customize this November wedding stamp. Colorful red, yellow and green Fall leaves fill the left half of this November wedding stamp. The text "November Wedding" on the right against a dark red background. Wonderful jewel tone floral wedding stamps with purple and dark red forming highlights for the backdrop of this November wedding stamp. The text "November Wedding" can be changed. Classy colors. December wedding stamp with pastel snowflakes. Personalized with your monogram, names and date. Swirly hearts and snowflakes in Christmas colors make a bright and festive December wedding stamp. The text "December Wedding" centered and surrounded by the swirls. Beautiful collection of two toned poinsettias against a dark red background for the text "December Wedding". Classic December wedding stamp. 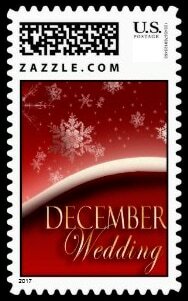 Red December wedding postage stamp with a background of snowflakes and the text "December Wedding" below a white swirl. A simple bouquet of pine and red winter berries with a script font for "Love" at the bottom of this Winter wedding stamp. Beautifully snowy country church with swirly blue text "December" and "Wedding" in a block font. Very cool December wedding stamp. A newly married Mr. and Mrs. Snowman surrounded by swirling sparkling snowflakes against a blue background. A wonderful winter wedding stamp. Classic style with this December wedding stamp done in black and white damask. Red border with small red bow tie attached. Cream flowers with blue accent create the background for this stylish December wedding stamp. Pin stripe bar holds the text "December Wedding" in designer fonts. Elegantly simple and compelling December wedding stamp. Single white and green calla lily against black with "December Wedding" in a silver font. Christmas red and white with drifting snowflakes background with December Wedding in gold designer fonts. A festive December wedding stamp. Christmas greenery forms the background to this winter wedding stamp. Two red and hollow interlocked hearts and RSVP in the lower right. Delightfully classy. A modern snowflake background design helps offset your initial and names. The text "December Wedding" can also be customized. Wonderfully simple December wedding stamp. Two red hearts against a pastel orange background framed by musical staffs and "December" in the middle. A very stylish December wedding stamp. Many of these customized stamps can be your personalized stamp with your names, date or your photograph. Easy. Simply click through any stamp for the available text and photo upload boxes. Nearly every one of these customized stamps can be re-tasked for a different month or season at no extra charge. Want to Make a Change? Contact the Designer.